Please Note: 'Turbo Pro Sect Quarter Scale' is currently not in stock and is only available as a pre-order. The Pro Sect quarter scale with integrated protractor. The simplest, easiest to use and most accurate quarter scale to layout balls. 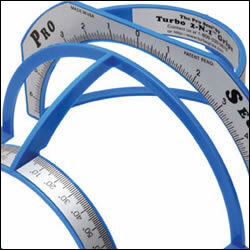 The Pro Sect features a labeled 180 degree protractor to indicate degree of angle for oval hole cuts and oval thumb insert installation and an easy to read ruler designed in 1/16â€� increments spanning the diameter of a bowling ball. Its intersection-molded design maximizes durability and assures the accurate layout of straight and perpendicular lines.